Posted on 13, March 2018 by EuropaWire PR Editors | This entry was posted in Agriculture, Management, Netherlands, Non Profit, Society and tagged Africa, agriculture, farmers, female farmers, Solidaridad. Bookmark the permalink. Utrecht, Netherlands, 13-Mar-2018 — /EuropaWire/ — Most female farmers don’t grow cash crops. Instead, they focus on food crops to meet the needs of their families. The reason many women are not able to expand their farming activities is due to a lack of access to finance, land, and technical knowledge. To address this, Solidaridad has adopted an inclusive approach across all interventions to support female farmers. In this article, we tell the story of Akua Ketua, a 52-year-old smallholder cocoa farmer in Ghana, and her challenges. Akua’s story mirrors the struggles of many rural women who work in agriculture in West Africa. Her story demonstrates the potential of supporting female farmers to become agri-entrepreneurs. Akua grows cocoa and other food crops on little over three acres’ of land. Her parents were farmers, so she gravitated towards farming as she grew older. Akua started farming with her husband about 30 years ago, however when the marriage ended, she had no land to continue farming on. Her former husband did not bequeath her any land and she had inherited none from her parents. Akua was lucky to identify a landowner who was willing to lease his land through a crop-sharing agreement. Ten years ago, she planted her first cocoa seedlings. She now shares part of her cocoa beans with the landowner, and keeps all food crops produced from the land for herself. Akua is happy about the arrangement. She has a piece of land to farm on and can earn a small income. As for many women, Akua’s farming skills have been passed down from one generation to another. All the skills she has have been acquired from her parents and former husband. Today, Akua recognizes that she needs more to continue surviving on this small piece of land. Her cocoa yield is poor. In 2017, she harvested just six bags from her three-acre farm and earned her an income of of $638 USD. The number of bags produced is a fraction of what she could harvest if all the right agronomic practices were applied. To illustrate this point; the average yield per acre of a cocoa farm in Ghana is between 10 – 13 bags. 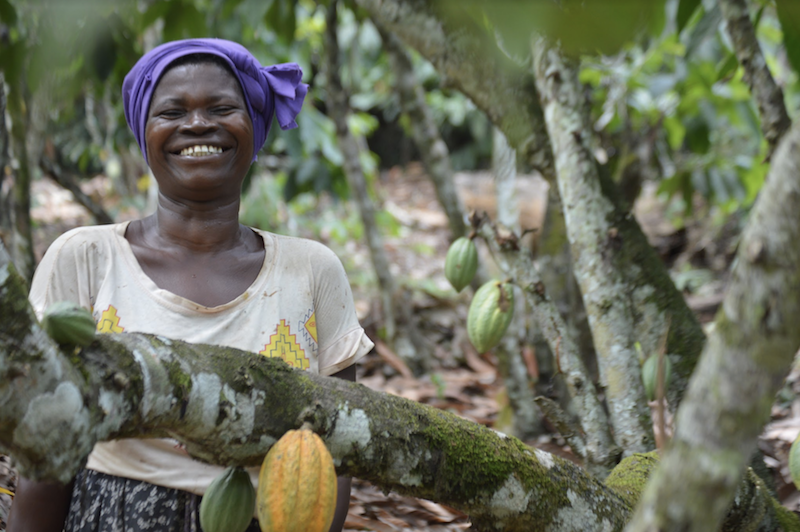 If Akua was producing optimally, her three-acre cocoa farm could yield up to 30 – 39 bags annually. This could earn her more than five times her current profit, between $ 3,192 and $ 4,152 USD. Training rural women like Akua in modern agricultural practices is key to enabling them to produce sustainably and to achieve economic empowerment. However, we also know that training alone is not enough. Women need access to finance to pay for labour services and agro-input to increase productivity. Within the cocoa sector, Solidaridad has incorporated financial literacy training for women in our interventions and supported Village Savings and Loan Associations. This enables female farmers to save over a period of time and helps them to access loans at a low interest rate. These loans can then be used to invest on farms or for other economic ventures. To support women’s challenge in securing land rights, Solidaridad is involved in dialogue at various levels of the governance structure to advocate for better land access. In addition, Solidaridad includes women in its climate change mitigation programme to ensure that women are aware of how to be climate resilient. Investing in female farmers has the potential to increase productivity and sustainability of various crops, enhance women’s economic and social position, and improve the livelihoods of farmer’s families. As is true for many women like Akua, agriculture is her main source of income. While Akua will continue to make do on her little income, her livelihood – and those who depend on her – could be enhanced through greater knowledge and resources to optimize her production. Learn more about Solidaridad’s cocoa programme here.